At the heart of Touch Blue by Cynthia Lord is a moral dilemma. A small island community decides to take on several foster children to prevent the closure of their one-room schoolhouse. Is it right to use children as means to a good end? Eleven-year-old Tess does not want to move to the mainland if her mother loses her teaching job. She dreams of growing up to be a lobsterman like her father. After reading Anne of Green Gables, Tess hopes that her foster brother will be her new buddy. Thirteen-year-old Aaron would rather be back on the mainland playing his trumpet in a jazz band. He's no grateful orphan but a sullen teenager who wants to live with his mother. She lost custody of him due to her substance abuse. The modern problems update the old fashioned story. What I enjoyed the most about Touch Blue was the island setting and the care that Cindy took in getting the details right. I know because I did similar research about lobstering for my adult novel S.A.D. The amusing bantering on the shipboard VHF radio was pitch perfect. The beautiful landscape was recognizable and totally captured summer in coastal Maine. 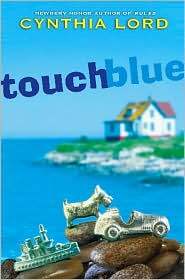 Touch Blue would be a perfect bedtime story or read aloud book in the classroom. Cindy makes novel writing look deceptively easy, but having read an early draft of the first chapter and synopsis, I know how much hard work and critical thought went into refining this literary gem. Cindy is my neighbor, and we became friends after I interviewed her for Rules. It was the first book review/interview I posted on my blog. Last week, we met in my backyard (above) and drove down to Harpswell to talk about writing. Sarah: Did winning a Newbery Honor for your debut novel, Rules, make it easier or harder to write a second novel? Cindy: It was much easier to sell my second novel because of the Newbery Honor, but it was harder to write. Events for Rules kept me very busy, and at every event, people would ask me about my next book. So I couldn't hold Touch Blue close in the same way I was able to do for Rules. I had to change the way I wrote for Touch Blue. 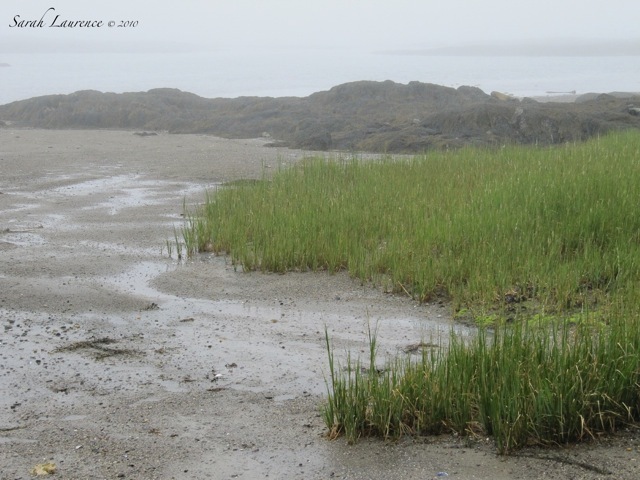 Can you tell us the story of the real Maine island that was the inspiration for Touch Blue? Did their scheme work? Touch Blue was inspired by several things. 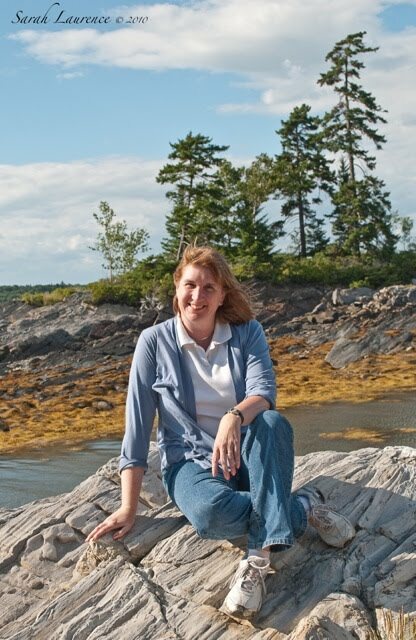 Before I had my own children, I was a teacher on a small island in Casco Bay. I took the ferry out and back from work every day, and it was one of my favorite teaching experiences. I've set Touch Blue in that bay, and I've used many details from my own experiences there. One challenge for all remote island schools is staying open. Over the years, Maine islanders have done some remarkable things to keep their schools from closing. Any small, rural place needs families with children to stay viable. If you can't attract families with young children to settle there, your population gradually grows older, and on an island, it often results in losing your year-round community. Islanders are very conscious that losing their school is the first step to losing everything. In the 1960's there was a small island in Downeast Maine that was down to two children in their school. The State of Maine was ready to cut off the school's funding, which would have effectively closed that school. So the islanders got together and came up with a plan. Their school needed children, and there were children in Maine who needed good homes. So several of the island families adopted foster children. That decision kept their school open, and that school is still open today. Do you think the islanders' actions were justified? It's not a simple answer. And that makes for a good discussion, I think. What surprised you the most about the system of foster care? How do you think it could be improved? I was surprised how difficult the system makes it for foster children. Simple things like wanting to take driver's education or stay overnight at a friends' house can be a huge challenge. In some states for a foster child to attend a sleepover means everyone at the friends' house has to agree to a background check. Ultimately, I was left feeling hopeful, though. I met some amazing, committed, open-hearted foster parents while I was researching this book. I wish every foster child could have the opportunity to belong to those families. Was the Maine island school where you taught similar to the one room schoolhouse in your novel? Yes, it was similar to the school I created for my novel. How was teaching on an island different from teaching on the mainland? Teaching in a tiny school on an island is very different from teaching on the mainland. On the island I taught a wide range of ages at once, and I had siblings in my class, which adds a different dynamic. Also, I had to do lots of jobs. If the phone rang, I had to answer it. I picked up the mail. I was the nurse if a child received a minor injury. In the middle of a lesson, I might get asked to sign for a package. An island teacher has to be more flexible, and yet, I loved the freedom of letting a project go a little longer if the kids were really into it (there were no bells to tell me to stop), and I could be creative in different ways. The kids were wonderful and there was a lot of parental and community support. 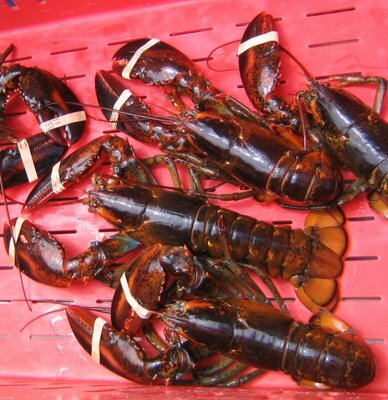 How did you research the lobstering parts of your novel? I've lived around lobster fishermen and their families for 20+ years now. I've even had kids in my classes who had their lobstering licenses and their own traps. Several lobstermen and their families graciously answered questions and they took me out on the boat with them to get the details and the timing right. One summer, my car smelled like bait every time it rained--which is not a very nice smell. My husband was constantly saying, "Um, honey. Let's take MY car." 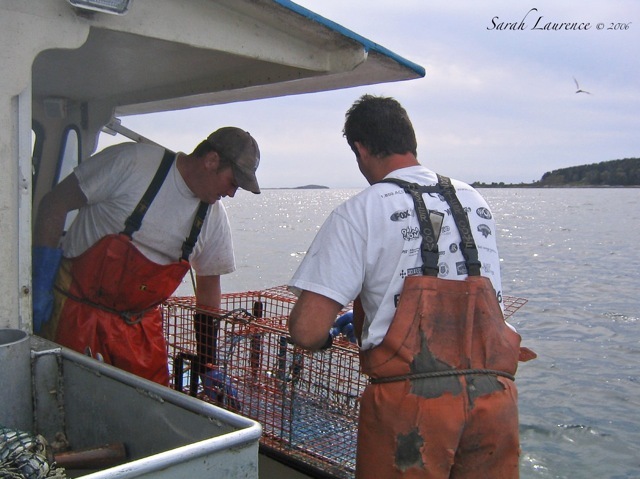 When Touch Blue was nearly done, I asked a lobsterman and a friend whose husband and three sons are lobstermen to read the book and comment. Fishing practices vary a bit from region-to-region, so I wanted to make sure Touch Blue was accurate for the area of Maine where it is set. Can you share something about your next novel? My third novel is at a very early stage, so I'm still discovering what it's about. I do know that it will be set in New Hampshire. I love dramatic settings, and I grew up in New Hampshire. My parents sold their house there last summer. It's a complicated thing to leave behind and let go of a childhood home. At night, I often find myself dreaming about that house. I think dealing with those feelings through a new book will be good for me--and for the book. Do you have a photo of you at the same age as the protagonist? What’s the best writing advice you received? "Find the story only you can tell and tell it in a way that only you can tell it." We all have powerful experiences inside us, and when we tap into those unique stories and perspectives, it makes for a great book. Thank you, Cindy, and good luck with your third novel! Touch Blue was released on August 1, 2010 in the USA. Photos and More Info: Cindy blogged about our time together with her photos and links to other interviews. I shot the first photo of Cindy and the wildflowers at Lookout Point, Harpswell. I took the lobster photo out on the marine patrol and the lobsterman out lobstering, while researching my novel S.A.D. (not published yet.) More photos of Bailey Island in Fog here (that's my daughter in the fog.) 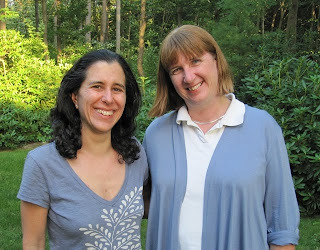 My husband, Henry Laurence, took the photo of Cindy and me in our backyard. 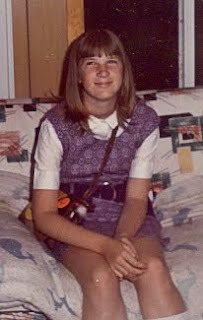 The photo of Cindy at age 12 was reproduced by permission. Reviewer’s Disclaimer: I requested a Touch Blue ARC. When I returned the ARC, Cindy gave me a published copy as a gift (the first copy she signed!) As a friend, Cindy gave me invaluable feedback on my young adult manuscript, as u like it. Very nice. I never knew about all the work that goes into writing a book. 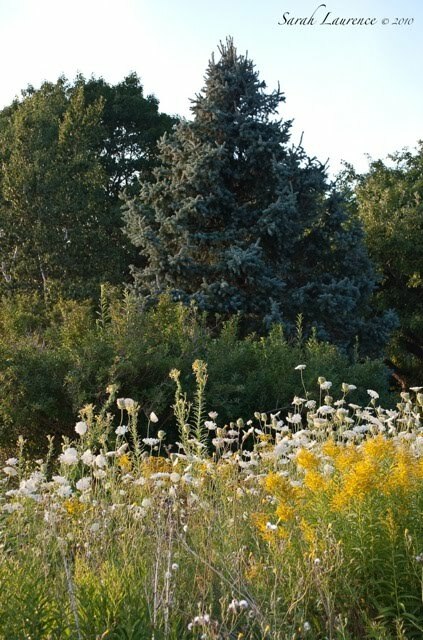 Love those wildflowers! Wow!! What a fabulous interview and review. :) I'm so excited to read TOUCH BLUE. Sounds fascinating. And you're neighbors - amazing. Thanks for the recommendation. From the beginning of this review, Sarah, I was intrigued--this is a book that sounds so appealing to me, even if it is meant for middle school readers. The question whether our motives for doing good are justified is a thought-provoking one. As always, I enjoyed the interview with the author, Cynthia. How lucky you are to be neighbors and to be able to share discussions about writing! A splendid review of a fascinating sounding book. The plot brings up so many important moral issues which should appeal very strongly to a middle school audience.How lucky you are to know Cynthia. This is such an interesting, fascinating interview and raises some important questions. I love the time and thought put into the book and the interview. And your photos really bring it all home. i really enjoyed this interview, particularly learning about the author's inspiration regarding plot and setting. what a lovely collaboration you and cynthia have worked out - it's great when authors can help one another. thanks for introducing me to cynthia's work and i have since visited her blog, which is great too! Tina, not everyone does so much research to write fiction but Cindy and I do. Keri, I’d love to hear what you think of TOUCH BLUE. I am so lucky to have Cindy down the road from me. Rose, when Cindy asked to whom should she address my signed copy, I said to me! I’ll buy another copy to give to my 9-year-old niece. You’re never too old for a good story, although it was written for elementary school children. Tricia, this book is close to home in many ways. Amanda, I'm always curious about the true stories behind the stories. It’s the main reason I interview authors. I saw the photo and said, "oh goody, an interview!". I do love your interviews!! Elizabeth, the moral issues would broaden the appeal of this story to older children (and grown ups) but it is written for younger readers in elementary school or as a read aloud story. Pamela, thanks, I enjoy interviewing. That was a great excerpt. Even if your review and interview hadn't gotten my attention, that would've. Thanks for the recommendation. Setting is so important, isn't it? I am always surprised when a writer doesn't take more advantage of interest in it. Lucy, I had a hard time picking an excerpt because there were so many I could have used. Patti, I agree on the importance of setting. Dear Sarah, I always enjoy your book reviews, made all the more interesting by your interview with the author, Cynthia Lord. Again, this is a writer I know nothing of so shall enjoy researching her and her work in closer detail. Thank you for the introduction! I like this interview. It's neat that you two are neighbors. There must be something in the water in Maine that makes for some good writers! This sounds like a good book; I'd like to read it. Wonderful interview and photos--as usual. My favorite part of Cindy's comments were when she talked about her next novel--her dreaming and feelings about her childhood home. I often think about knocking on the door to mine and seeing if I could have a tour, wondering what it would be like to be between those walls again. It's one of those places that calls me back and bound to be good fuel for a novel. Sounds like a great idea for a book and a wonderful setting. What a wonderful interview and review. I want to be neighbors with you guys!!! I have two perfect readers for TOUCH BLUE: my daughter and me. :) Thanks! Edith, if you enjoy classic children’s books you’ll love TOUCH BLUE. Donna, not only am I neighbors with Cindy, we’re basically on the same road as Charlotte Agell, the children’s author I interviewed last month for the book review club. Cindy used that same “in the water expression” when I interviewed her for RULES. Three novelists living on one road in a small town is an amazing coincidence. The water is good. I’d love to hear what you think of TOUCH BLUE. Cynthia, it was hard for Cindy to say goodbye to her family home even though it was the best choice for her parents. I understand the impulse to replant one’s roots in literature. I stuck a character in “as u like it” in an apartment my parents rented for my early childhood. I actually got to revisit it because a girl in my homeroom was living there in high school. It seemed much smaller. If “as u like it” is published, that girl riding her tricycle in the hall in chapter one is me. Stacy, the setting is wonderful as is the book. Barrie, I wish you were our neighbor too! Being your cyber neighbor is the next best thing. I’d love to hear what you two think of TOUCH BLUE. Thanks for hosting the book review club. Sounds like a great book! And as always I enjoyed the author interview. very descriptive review and great interview. I'm going to have to read this one. Thanks so much for stopping by. JAPRA, we were going for the blue. Kaye, I’d love to hear what you think of TOUCH BLUE. Love this interview! Photos are gorgeous. Thanks so much :). Jama, welcome to my blog and thank you! I loved your review of Touch Blue too. It’s so nice to connect with you through Cindy. What a fabulous review ... I want to read this one!! Congrats to Cynthia! How cool that you're neighbors too (your back yard looks gorgeous!). Wonderful photos too (as usual!!). I have to admit that I'd never thought of the theme on which the novel focuses. It seems to me that the issue Cynthia presents is not a black and white affair. Coupled with the research she conducted according to your excellent review and interview, this sounds like a must-read book. By the way, I loved your photos of the fog. I love foggy, misty, cloudy days. Nothing wrong with sunshine (and today we had a glorious day here in London, quite appropriate for my wife's birthday) but I love my grey days. I definitely do. Brilliant pictures. Kelly, I’m lucky to have Cindy as my neighbor and a forest for a backyard. Do let me know what you and your children think of TOUCH BLUE. Enjoy! ACIL, even though TOUCH BLUE is written in simple language for elementary school children, the subject would be interesting to older readers. This book would be a good one to share with your daughter. I get better photos on foggy days than on hot summer days so I enjoy both. Happy Birthday to your wife and have a wonderful time with your mother! How nice that she is visiting from Cuba. I haven’t been online much either. We’ve been out enjoying a Maine summer. Wonderful interview and photos! 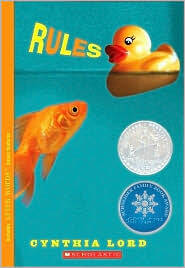 I loved Rules, and am so excited to read this new one! Laura, I’d love to hear what you think of TOUCH BLUE. By coincidence, I recommended your novels to Cindy that day. She recalled being on a Listserv with you. It’s such a small world.